Mangalore lies on the backwaters of Netravati and Gurupura rivers. It was once declared as the eight cleanest city in India. Lying between Arabian Sea and Western Ghats, Mangalore still remains as an important port of India. Its also one of the main pilgrimage centers with many important temples , church and mosques situated here. Some major ones being Mangladevi temple, Kadri Manjunatha Temple, Gokarnatha Temple and many more. This temple around 3 km from the bus stand. 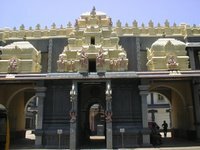 This is considered to be the most beautiful temple in Mangalore. Earlier it was a very small temple with a small Garbagudi of lord Shiva, 8 years back this temple was renovated. Today it is a massive temple with ample space in and around the temple laid by white marble and gorgeous scandal air. You can find beautiful statues carved in Plaster of Paris of various avatars of lord shiva. At the entrance it has 2 massive elephants made of plaster of paris as though guarding the temple gates. Daily pooja and offerings takes place for lord Shiva, Lord Ganesha, Lord Subramanium, Goddess Annapoorneshwari, Lord Krishna, Lord Bhairava and Lord Shani. You can also see the beautiful chariot of Arjuna and Krishna depicting a scene of Geeta Upadesha from Geeta. The whole temple is painted in Gold and Maroon colour. In the evening with the sparklingly lights of neon it looks magnificent. It has become a very important tourist place in recent times, people come from all nearby states and also from North. This is situated around 2 kms from the city. This is exclusively Lord Ganapathi temple. There is a small scared idol of lord Ganapathi. At the entrance there is the garbagudi of Lord shiva. There will be special poojas and offerings on Ganesh Chaturthi and Sankasti. This church is situated just 1 km from the city bus stand, it is few steps from the Light House hill. This church was built way back in the year 1900. The main attraction of this church is the beautiful paintings of an artist named Anthony Moshaini from Italy. It is a architectural gem of Mangalore and often compared to the Sistine Chapel in Rome. One should not miss the beautiful paintings brushed on every inch of the wall and ceiling of the church. Behind the church there is St. Aloysius Church. The central row of paintings on the wall depicts the life of Aloysius Gonzaga to whom the college ad the Church is dedicated. This man gave his life time service to 5000 students studying in the campus. The rest of the painting shows the birth and life of Jesus from the day he was born to his crucification. This is indeed a masterpiece painting. Due to heavy rains and water seepage some of the parts of the paintings are spoilt and lost colors. But the church authorities have taken steps to restore the paintings from time to time maintenance. This church is situated in the heart of the city. It is a massive structure visible from ay part of the city. This church is said to be built by a bishop named Thomas de Castro in 1680. Attached to the church is the chapel of St. Monica. This church too has the french paintings of St. Monica and her son St. Augustine. The Church is probably one of the many artistic houses of prayer in the District. The Church also contains the miraculous shrine of st. Anthony of Padua, the great Wonder Worker. The Shrine has attained an all India fame and attracts on enormous congregation every Tuesday at the weekly devotions and the two feasts of the Saint on 4 February and 13 June. The three oldest churches founded in South Kanara in 1526 were the Our Lady of Rosary at Bolar, one at Fajir and another at Farangipet. The church at Bolar, with its large and imposing structure is a standing tribute to architecture. This is the only church in the diocese which has a magnificent dome crowning the spacious sanctuary. This dome was built on the pattern of the one at St. Peter’s Basilica in Rome. This entry was posted in Holidays, Karnataka, Temples and tagged Ajmer Dargah, Aloysius Gonzaga, Annapoorneshwari, Anthony Moshaini, Anthony of Padua, bhadrapada shuddha, Brahma Kalashothsava, Bus numbers, Car street, chariot of Arjuna, church mangalore, Deepasthamba, Deepavali, Dhanurmaasa pooja, Durga sculptures, Fajir, Farangipet, fishermen community, Garbagudi, Geeta Upadesha, Goddess Durga, goddess Mari, GOKARNATHESWARA TEMPLE, Jumma Masjid, Kadiruthsava, KADRI MANJUNATH TEMPLE, Kadri temple, Konkani community, KUDROLI, Lady Rosary Bolar, Lord Bhairava, Lord Ganapathi, Lord Krishna, Lord Shani, Lord Subramanium, lord Venkateshwara, MANGALA DEVI, MANGALA DEVI TEMPLE, mari gudi, Mari Pooja, Mathsyendranath, MILAGRES CHURCH mangalore, muslim community, Rathothsava, ROSARIO CHURCH, Sayyid Mohammed Shareeful Madani, SHARAVU MAHAGANAPATHI TEMPLE, Shiva, Shivarathri, Sistine Chapel, South Canara, South Kanara, ST ALOYSIUS CHURCH, St. Augustine, St. Monica, Thomas de Castro, Thrilokeshwara, Ugadi, ULLAL DARGA, Ullal mosque, Uroos, urva, URVA MARI GUDI, VENKATARAMANA TEMPLE. Bookmark the permalink.